At end of slide show, go to "See full album" for a closer look. 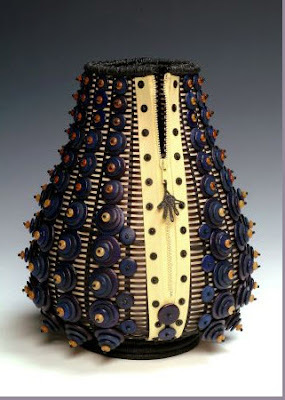 This is the work of JoAnne Russo, contemporary basketmaker from Maine. This is part of her "Pod" series. 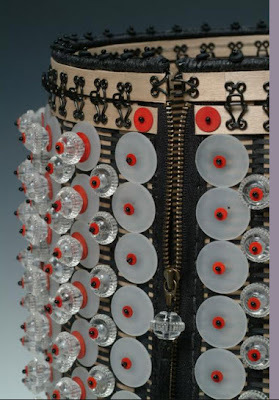 What attracts me to her work is her use of unexpected materials like buttons, and zippers, and eyehooks. 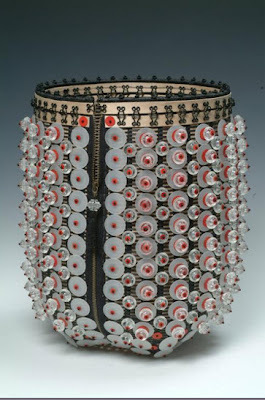 her application creates an unusual sophisticated surface design, they transcend their use and take on a new meaning. Ms. Russo started making baskets in 1984. 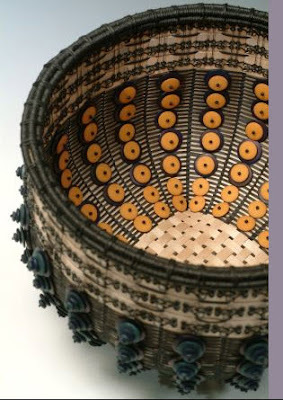 She was inspired by the works and basket techniques of the basketmakers of long ago from Mount Agamenticus in York, Maine. 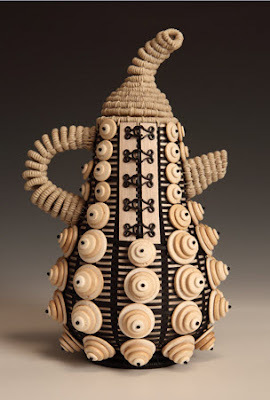 She was able to learn their techniques and incorporate them into her work. It involved selecting the right kind of Ash tree, splitting the wood for handles and rims using tradtional tools and then finally weaving the basket. 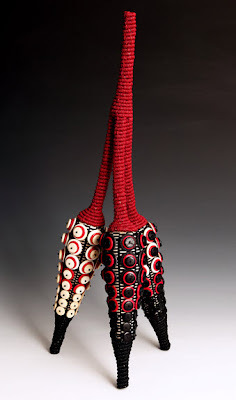 She was also inspired by basket makers from Native Americans from the north east and the southwest. 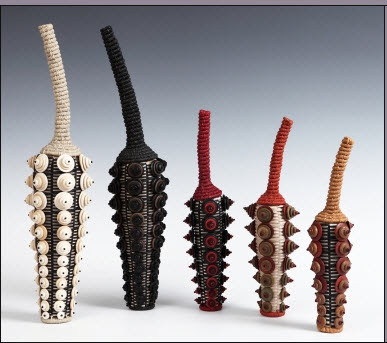 She started to incorporate porcupine quills and other natural materials which gave texture and individual presence to each peice she refers to as "Animism". Here is a close-up. These pieces are from the "zip it" series. surface. 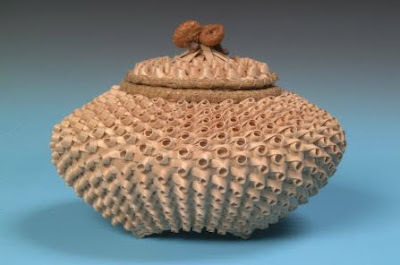 Below is a basket whose top is made using acorns. Her use of simple acorns adds a certain quiet elegance to this piece. The pieces also look wonderful together as a group in the "chili pepper" series. surface decoration of architect Robert Adam . I am always impressed by taking unconventional materials and using them in such a poetic way. Russo has won numerous awards. 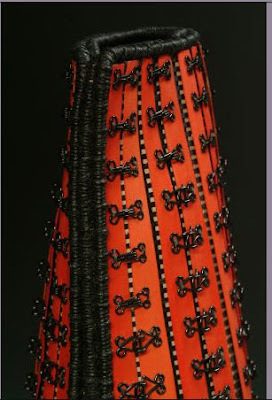 Her pieces have been purchased by several museums including the Boston Museum of Fine Arts. A formal fine art background is the strong foundation on which I have built my interior design business. Originally from Woodmere, NY I obtained a BFA in textile design, 1974 from Phildelphia's Moore College of Art and Design. 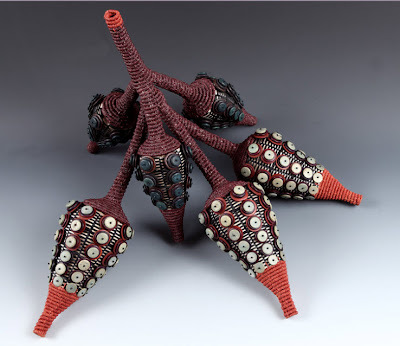 My career started with weaving large scale tapestries for commercial and residential spaces.I exhibited my tapestries and gained recognition by organizations such as the Woodmere Gallery in Philly for tapestry and the Allan Stone Gallery in NY for fiber collage. Armstrong World Industries has used many of my fiber collages for its flooring ads in national magazines. In 1989 I was awarded best interior design for a condo by the Lancaster Parade of Homes. By 1992 my repertoire expanded to include all facets of interior design service: design consultation,floor plans, custom funiture,drapery, wall covers,and rug design. My goal is to interpret my clients' tastes. On their behalf I routinely work with other design professionals such as architects and furniture makers.We collaberate on interior and exterior finishes,cabinet and furniture design. Additional services include art procurement as well as accessory placement,and personalized shopping.